suggestions for how to quilt hand-embroidered blocks? Thread: suggestions for how to quilt hand-embroidered blocks? My Mum rocks! 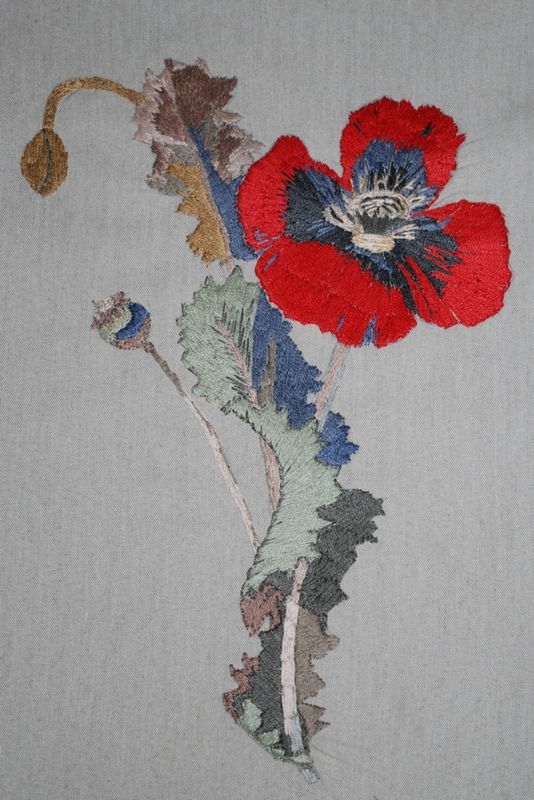 She took up hand embroidery about 3 years ago, when she was already well into her eighties. 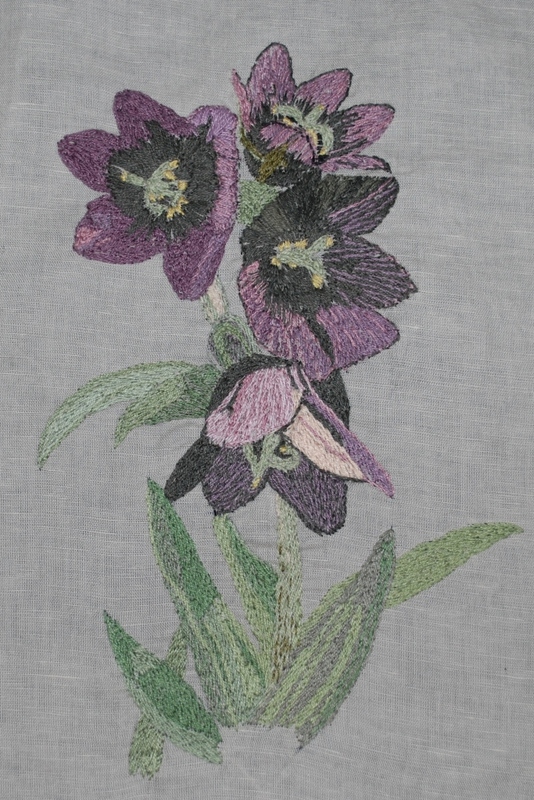 She is completely self taught and does floral pieces, usually traced by me onto fabric from photographs in gardening books, or from my own photos. She has done many, now, with no other goal than her own amusement and creative expression. Her work is beautiful, and original. Last year I suggested to her that I could make a small quilt out of some of her pieces so that they could live in her living room, and not just folded up in a basket somewhere. She liked this idea and sent me home with a bunch. All are on different sized pieces of fabric, and the fabric itself is a real mixture ranging from homespun to synthetic lightweight upholstery fabric! I stabilized them with fusible, made them into uniform blocks, and then pieced the blocks together with sashing and borders that match the fabric I used to make the blocks uniform - my goal was to have the embroidery "float" on a fairly neutral background. My problem is that I don't know how to quilt the embroidered pieces themselves. I plan on FMQing continuous ivy/leaves/vines in all of the background sashing and borders, but I don't want to do anything to detract from the embroidery in the fabric surrounding Mum's actual stitchery. Suggestions? A fine stipple in thread exactly matching the various base fabrics? Echo quilting? Tiny little "stay stitches" just to anchor the blocks? echo quilting would make the embroideries 'pop'- so a couple lines of echo- then filler stippling would be very nice- or echo- then cross hatch the negative space would look quite nice too. Use the batt that allows for quilting 10 inches apart. 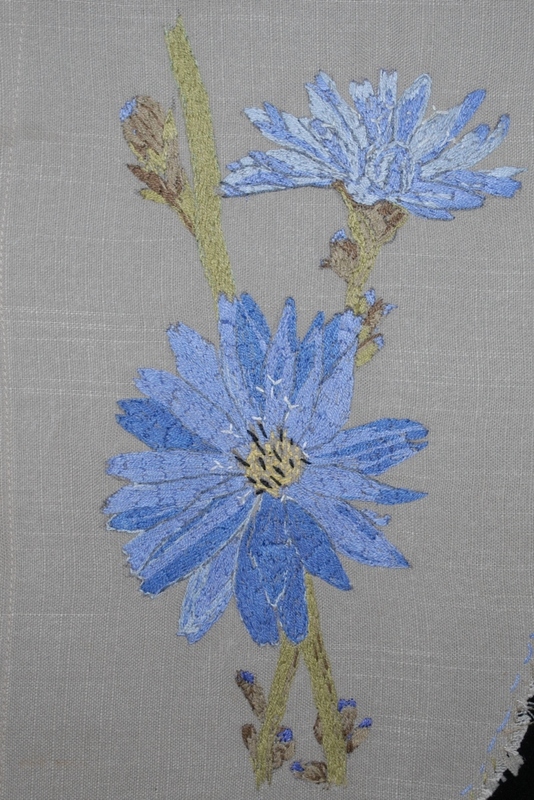 I would then outline the embroidery in a thread matching the background. Once they were outlined it is up to you if you put any more quilting in the blocks. Just want to say what beautiful work your mum does. Very nice! The embroidery work is just beautiful. Perfect. and really good shades too. I would go for the echo stitching around the flowers and work out to stippleing in the color of the back ground. what ever you come up with will be great. GOOD LUCK. I agree. Use a batting that allows more space and do as little quilting around the flowers as you can get away with...they're stunning all by themselves! Maybe just stitch a "frame" in oval or rectangle in a pretty stitch around each motif. I like your idea about the ivy/leaves/vines in the sashing. That will truly finish off this work of art. No help but just wanted to say congratulations to your Mum for doing such beautiful work and trying something new at an advanced age. Would love to see it when you finish it. I agree that your mother's work is beautiful and making a quilt from her work will be a timeless heirloom for many to enjoy. Those flowers are awesome! I am so glad you are making them into a quilt. It will be breath taking! As for the quilting, I agree with Tartan. Your mother has a talent! Those are stunning!! To show off a center I prefer a star-burst design or a cross hatch rather than echo quilting. To me, echoing detracts from the design if more than a single or double echo. Perhaps "frame" each one in a heart or diamond shape with star burst straight lines, then between each shape either cross-hatch, stiple, or some other simple filler that is more dense to make the shape with the embroidery pop out. May your stitches always be straight, your seams always lie flat, and your grain never be biased against you. This is my first instinct too, thanks! Good point about the low-quilting batt - I hadn't thought of that, and it will certainly simplify things. I really don't want to take the focus off Mum's work! Thank you on behalf of my Mum! She has claimed for years to be the unartistic and uncreative member of the family - NOT! I will definitely post a pic when it is all done. Thanks for the suggestion. I think (knowing my Mum's tastes) that I will probably stay away from straight lines as much as possible - I've already got way more than I wanted with the sashing and borders, and if the individual embroidery pieces had been uniform in size originally I would have appliqued them on in oval or freeform shapes to avoid the rigidity of the sashing. I love the idea of a starburst pattern, though, and I will definitely use that in a future project. I appreciate your thoughts, y'all! She does beautiful work! Others have the same suggestions for quilting that I do. Your quilt will certainly be a work of art.. I would do echo quilting all the way to the sashing on these...no stippling mixed with echo. If you do 1/4" echos all the way out to the sashing, it will look like ripples on a pond. She does gorgeous work!